Triple layer mesh ensures great air circulation and keeps you cool, while preventing bee stings. Flow Hive technology drastically reduces the chance of being stung during harvest, but if you drop a full brood frame during a routine inspection, you are sure to attract unwanted attention! This package also comes with lightweight, ventilated gauntlet goatskin gloves and a J-style hive tool handmade with German stainless-steel. Three intersecting layers of mesh makes it difficult for a bee’s stinger to penetrate and ensures airflow to stay cool. The lightweight fabric makes it easy to wear for longer beekeeping sessions. Fully removable veil provides outstanding sting prevention and practicality. Using high-gauge heavy fencing-quality mesh for solid sting prevention on the flanks and a finer gauge mesh over the face for better visibility. Another unique feature! Our J-Tool comes with a unique and special pouch designed to provide protection from sticky honey, messy propolis and the potential to damage your suit. A large velcro hook-and-loop fastening strip secures it in either hip pocket. Made from medium-weight organic cotton drill. The extra deep hip pockets also include inner pockets and hook-and-loop to hold the J-tool sleeve in place (ambidextrous design). The chest pockets include extra long hook-and-loop fastening top flaps to keep pocket contents safe. Provide comfortable and secure sting prevention. Thumb stirrups at each wrist and over-boot stirrups prevent clothes riding-up during the most rigorous activity, ensuring no exposed skin for bees to find. Ankle to knee zippers ensures you can easily put your suit on over your boots. High quality rugged, plastic YKK zippers have an oversized ring pull tab making them easy to use when wearing gloves. Reinforced cotton drill padding provide durability and plenty of comfort when working with your bees. High cotton collar and wide band of cotton across top of mesh veil provide protection from the sun. Super-soft goatskin gloves are very practical and comfortable to wear. The pliable goatskin are very functional, making gripping objects much easier. Mesh around the wrist allows airflow, and the cotton gator is elasticised at the elbow to prevent unwelcome visitors from entering your suit. Durable yet soft cotton pockets and padding ensures our suit is both comfortable and practical, while supporting the environment and the wellbeing of those who have contributed to its creation. Looking for even more information? Check out this article on our blog. 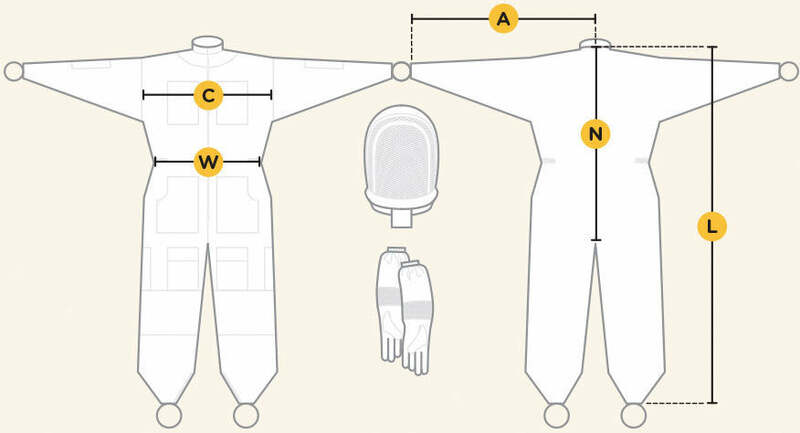 NOTE: The sizing chart below provides measurements of the beekeeping suit fabric itself, not the body measurements. In order to properly use this chart you need to compare the chart to your own body size measuring over the top of your clothing and include additional length for movement (to allow ankles and wrists to remain covered). Be sure to give yourself plenty of room to move around. Beekeeper suits are typically worn slightly baggy - you do not want these to be tight fitting. It is the loose fitting cotton material that keeps you from getting stung . the torso, or 'nape to crotch' in the sizing chart shown below. To properly calculate this measurement, measure your own body from the top of your shirt collar to about 15cm / 6in below the bottom of your crotch. the next measurement to consider is the “nape to ankle hem” and add about 15cm / 6in. Finally, measure the "waistband circumference" which is a part-elastic waistband. You will want the elastic waistband to be comfortable for your individual size, so please refer to the “relaxed” measurement plus enough extra room for ease of movement and comfort.